Canada beats USA...I mean, Pens Win. 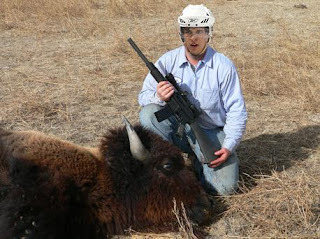 Sidney Crosby decided to kill some Buffalo tonight. Evidently you kill Buffalo with a machine gun, or so it appears. That is a clip under there, no? Anyhoo, I don't think there's enough words to say about the kid we here at Pens Universe call Superman. He's 22. He's accomplished nearly everything there is to accomplish in hockey. If he wins a Gold in this years Olympics what's left? Maybe he signs a one year deal with the KHL and wins the scoring championship and the Gagarin Cup? If he did, he would, and you know it. But ladies and gentleman this kid is all Pittsburgh's. And you can partially thank 66 for that. Okay, off my rant about Sid and on to the game. Truthfully this game could be told so much better by Whistler seeing as he was in attendance. And unless someone else tells me otherwise I'm quite sure after this tweet of mine he started stripping, seeing as we were down 3-1 and all of the sudden tied things up. Now I'm not going to get to crazy here, I have a screaming 1 month old names Liah Sydney. Likely she's not mad but still bugging out over her name sakes unbelievable performance. Damn, okay, sorry. Didn't mean to bring Sid back up. 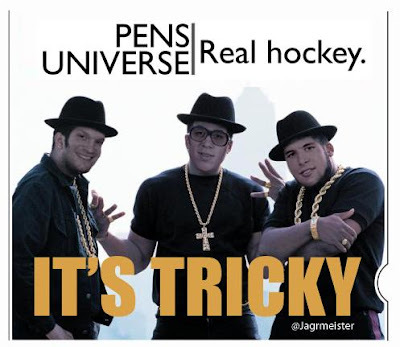 Seems to me the win over Detroit sparked a little something for the Pens because they played like maniacs. Right from the start WBS superstar "Marky" Mark Letestu (the name will stick, though I do like "tubes") takes a nice feed from TK to put the Pens up 1-0. Kennedy is not well known for his dishes, but man was that pass right on target. Sadly Buffalo came right back to take the lead with two quick ones. Then after going down 3-1 we rattled off 4 straight. Wooo City. Jordan Staal looked like he was on acid for really real. No clue what got into him tonight but if there's one thing I know for sure, he's staying on the line with Malkin. Why? He's got free reign to do what he will. Smart move by Bylsma and company. So our 3rd line isn't what it might have been. But if you take the skill of Malkin and Staal and combine the two, I smell a new two headed monster being created. And did you see when Rupp was out there with them? That has to be the best line combination of size and skill in the league. I have to admit the Sabres are a good team. I actually rendered them as the sleeper for this year. When you have a couple young guns and a solid goaltender you can, well, even win the Stanley Cup. But we had their number this year. Aside from the monumental collapse the last time we met, we've owned the Sabres. Winning the season series 3-1 is very nice come playoff time, assuming Buffalo doesn't get mad cow disease and flounder like last season. Right Kurt? Fleury, semi-solid night. Let a few by that made me bite my hat. 1 for 2 on the powerplay, 50% is 50%. Geno has a 8 game point streak, two helpers tonight. Letang is showing up for real. 24 minutes of ice time and two helpers. Sarge, Eaton, Letang, 29 shifts a piece. Can you say D-Fence? Dupuis, decent game. Lots of energy and success along the boards.